With the Audex CD ripper, you can start digitizing your personal music collection immediately. Linux has long established itself as a multimedia platform. The resulting wealth of applications makes it difficult to find the right program, especially for the casual user. If you want to rip audio CDs for your private party, your options at first glance are heavyweights like K3b, Rhythmbox, or Amarok, which all require significant familiarization time – or you can get started within 30 seconds with the compact audio ripper Audex  . Audex is found in the software repositories of the major distributions; you can install it with a couple of mouse clicks using your distribution's graphical package manager. Depending on the distribution, you will then find an appropriate starter in the Multimedia or Entertainment submenu. The software quickly opens a self-explanatory program window in which – initially – no active controls appear, except for the menubar. After you insert an audio CD, Audex reads its content and displays the titles in a list view on the right side of the application window (Figure 1). If you have an Internet connection, it automatically downloads the metadata, such as the cover, title, year, and genre, from the Freedb.org servers. If the ripper finds several CDs with the same title in the Freedb.org database, you can select the correct medium in the next dialog. Figure 1: It's hard to make things more intuitive: the Audex application window. Before you start ripping from the audio CD, you need to make some basic settings. They can be found in the Settings | Configure Audex menu. In the CDDB Settings, select the database server that Audex will use to retrieve the data from Freedb. As an alternative to Freedb.org, Audex can also use MusicBrainz . As the storage location for the MP3 files ripped from the CD, you will want to choose a directory on a partition that has sufficient free space. Alternatively, you can enter a network share on a server or NAS: This stores your music centrally and makes it accessible to other machines on your local network. If your computer has more than one optical drive, you can also determine which drive to use. 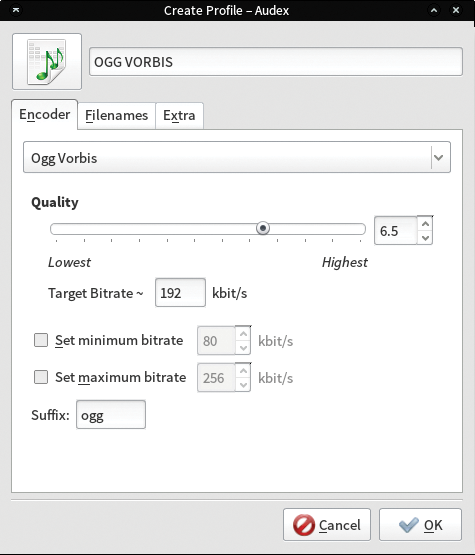 Audex does not have its own encoder to convert music to MP3 or Ogg files and thus only supports the handling of files in the proprietary wave format. In the Configure window, you can determine under Profiles how this should happen. As a WAV, an album can easily occupy 700MB on your hard disk; you should thus take care to install the necessary codecs. First, you need to install the required encoders – usually MP3 and Ogg Vorbis – from the software repositories of your preferred distribution. To do this, install the lame and vorbis-tools packages from the repositories. If you want lossless recordings on your hard disk, I recommend installing the FLAC encoder, which you will find in the flac package. In the Profiles section of the Audex settings window, press the Find codecs button. The software now automatically detects the installed encoders and adds profiles to rip at different levels of quality for each of them. If you do not find the audio quality you want in the automatically generated profiles, you can set up your own profile using the existing codec by clicking on the +Add button in the Profile window. Audex opens individual settings dialogs for creating the profile depending on the selected codec (Figure 2). Figure 2: You can create profiles for any audio quality. Conversely, you can also delete previously integrated profiles that you do not need, by pressing the Delete button in the Profile window – this makes the profile list more clear cut. The entered profiles are then available at the top center in the main window of the program in the Profile panel. Getting that iTunes experience requires more than just Amarok or Rhythmbox. It also requires planning – especially if you went digital before the Linux desktop had audio players.